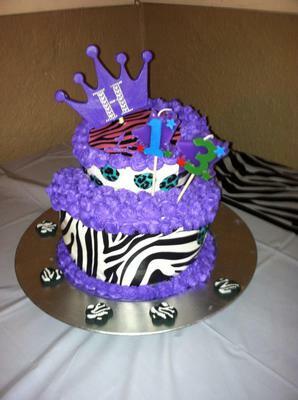 This was my first time making a topsy turvey cake. First I baked off three eight inch round cakes and three six inch round cakes. I used a pound cake recipe for stability. I froze the layers overnight to make it easier for carving. I stacked the three eight inch rounds and iced them in between layers. Then using a knife I cut the top layer at a 45 degree angle. Then I flipped it around to make a slope. I made a template from my six inch round cardboard and sat it on top and cut out the circle then scooped it out to the next layer. I used dowel rods and the six inch cardboard for support. I stacked, iced the six inch rounds and sat them in the hole cut the top at a 45 degree angle and flipped it around facing the other direction. 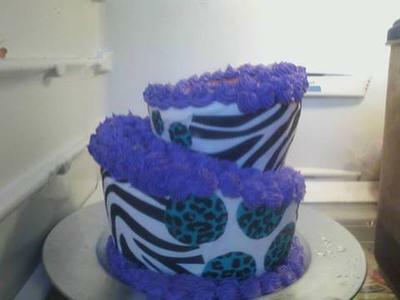 I iced the cake and used sugar paper for the animal print. Using my star tip I swirled the icing on the bottom layer and added my border. I painted a chip board crown a little bling H for her name.